Trilogy of Terror”, a Dan Curtis telemovie, was a collection of three horror anthology stories featuring Karen Black in four different roles playing tormented women. While all of the tales were notable, it was the third which has become legendary. In the final story, Amelia in a solo horror story monologue plays a mother-dominated woman who buys an African Zuni fetish doll for her latest boyfriend in which the doll comes to life and terrorizes her in her own apartment. The following is the culmination of that struggle, and is still some of the creepiest television ever shot. What’s even better, is that given YouTube’s groovy related videos feature I found a film dealing with Zuni fetish dolls that I had never seen before, seems like it is a veritable sub genre I have not been clued into before YouTube. Here’s a clip from the 1985 movie Attack of the Beast Creatures, obviously inspired by the Trilogy of Terror -with little of the terror unfortunately. What’s more, through a quick search I found out that there is an actual doll one can buy based on the African Zuni Warrior doll from the movie, which is too frightening to even imagine. On the other hand, I think I could live with the Evil Krusty the Clown parody of the demon doll from the “Clown without Pity” episode of the Simpson’s Treehouse of Horror III. Why is it that dolls are so damned freaky? This entry was posted in movies, video, YouTube and tagged attack of the beast creatures, horror, karen black, krusty the clown, movies, the simpsons, trilogy of terror, YouTube. Bookmark the permalink. I love Karen Black and I love that ending. Truly scary. The Zuni Demon doll is scarier than Chucky because he is doubly Other. Maybe that’s why Chucky resonates. It could be in your kid’s toybox and he could kill you!!! Just a little provocation . . .
As soon as I saw the photo, I had bad vibes. And I can’t believe how much Karen Black looks like him at the end (that came back to me too). So when I can’t sleep tonight, I am most certainly going to blame you, Jim. Hahaha , I remember this! , I saw ” Trilogy of Terror ” several years back when I was in college, We were looking for a scary movie to watch for our Friday movie night and I happen to stumble upon it. Your right the African Zuni Fetish Warrior Doll is far scarier looking that Chucky for that matter scarier than a lot of those tiny monster movies that came out later ( Fiends , Demonic Toys etc….). That little Zuni fetish doll remains one of the scariest monsters for me ever, even though it was so obviously fake and cheesy. Maybe because it tore apart Karen Black’s legs so convincingly?—or maybe because the great Karen Black was so convincingly frightened as an actress? I don’t know, but I do know that doll remains one of the pinnacles for horror from my childhood, right up their with the twins in The Shining. This movie scared the life out of me as a child, and terrorized me for years. The sound of the tiny feet as he runs around was implanted in my memory for all time. Now 33 years later, I will have to sleep with my lights on again. It is still by far the scariest thing I have ever seen. Thanks. 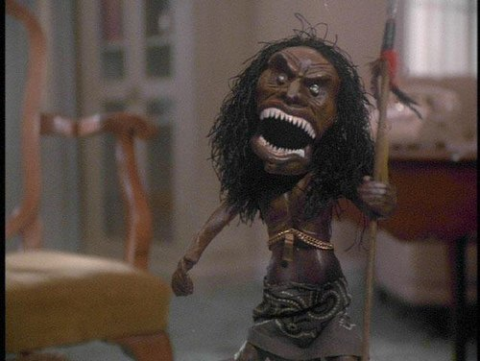 The Zuni doll episode is the only one I remember from the Trilogy of Terror. I haven’t got a clue what the other two were, but after 30? years, I still remember that little guy running around with that knife slashing at Karen Black’s ankles. I went to read I am Legend and found that story in the book as well. Brought it all rushing back. God I loved this movie (best of the three). Me and some others guys were tripping on some LSD (honestly) the night this was on (I was about 18). Sh*t it scared the crap out of me when the ending came up with her face turning. Can’t forget it!